Datxplore is a graphical and interactive application for the exploration and visualization of data. Datxplore provides various plots and graphics (box plots, histograms, survival curves…) to study the statistical properties of discrete and continuous data, and to analyze the behavior depending on covariates, individuals, etc. Datxplore is used for continuous, discrete and event visualization along with covariates. The user can filter, select and split data in the data set. Moreover, the user can recreate categories to fit with the variable of interest. The user can select, filter and split over all the covariates of the data set. The data set is a key element for the parameter estimation and is a key element to summarize the experimental data in a file. A dedicated mini-website describing the data set for Datxplore and Monolix is proposed here. 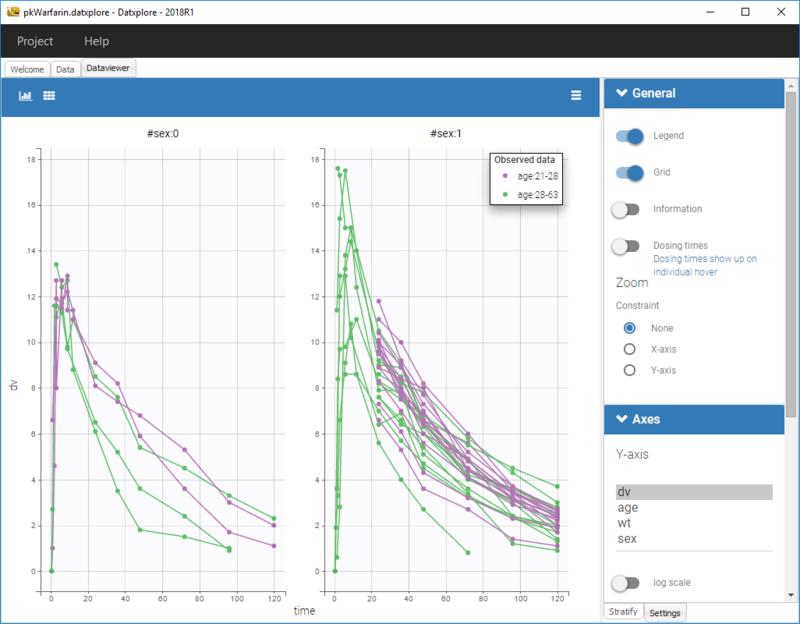 Datxplore provides various plots and graphics (box plots, histograms, survival curves…) to study the statistical properties of discrete and continuous data, and to analyze the behavior depending on covariates, individuals, etc. A dedicated web site for Datxplore documentation is proposed.